We hope you all had an amazing summer. Recently, we've been thinking about and talking with other art teachers about creative clothes to wear to work. There is an old adage that says, "If you dress better, you'll feel better". With the sometimes very messy work that we do as art teachers, large class loads, staff meetings.....etc., our daily outfit for work is usually the last things on our minds. Some days, just getting through the day without a student putting art tools in their mouth is a major accomplishment. But, since visual expression and representation is a big part of what we do, maybe the old adage should be considered as we head into this new school year. Here are several tips to help you begin the new school year with a new look. If you enjoy dressing up a little bit more then the average person, then check out these two lovely ladies for some fashion inspiration. Folake Kuye Huntoon is one of the most stylish women on the internet. Her daily fashion posts display simple elegance and creative style. Click on the picture to visit her website to find out where to find these stylish clothes. Cassie Stephens has one of the coolest blogs and youtube channels online today. She designs and creates clothes inspired by great works of art. Her relatable demeanor make her tutorials fun and easy to watch. If you're like me and have more of a "yoga pants" fashion style/preference, then colorful accessories are a great way to spruce up your work wardrobe without losing comfort. Colorful scarves are a great way to add a simple pop of color and style to your daily outfits. There are several online stores in which you can purchase scarves with works of art printed on them. These Pantone colored Converse are so cute and a great way to teach students about the color wheel. You can also paint a pair of white tennis shoes with your own art or art inspired by one of your favorite artists. Colorful t-shirts/tank tops are a great way to elevate your comfortable work attire. We designed and sell this tank top on Zazzle. You can also create custom shirts on many other online websites. I tend to be a little bit messier in my artistic expression, so an art apron is a necessity for me. The fun thing about being an art teacher is that wearing an apron everyday is totally acceptable. 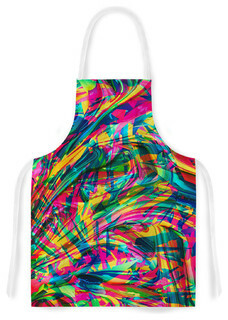 You can purchase, paint or create your own colorful apron from an old t-shirt. Make sure to visit our Pinterest page for more tips. Have a great school year and share your ideas for creative outfits for art teachers by commenting below. Drawing in The "Real World"
In high school, many students take art as an elective and do not realize the significance and necessity of art in the "real world". In the past I have been asked by art students, "How can I use what I learn in art to make money or get a job?" We did this video two years ago to briefly explain how one can use the skill of drawing to establish a successful art career in the real world.